Mommy, Why Is Our Internet SOOOO Expensive? I've talked elsewhere about the impact of immutable laws on networks and pricing. 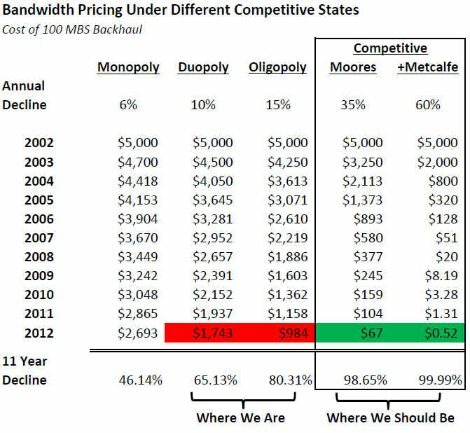 The best way to understand where we are is to look at bandwidth prices in the “middle mile”. Private lines are one of the essential costs in any service provider's model and can represent anywhere between 20-80% of their cost of revenue depending on the market and scale (for startups and rural carriers it is closer to 80%). 10 years ago 100 megs per second (mbs) cost $5,000 per month for an average private line circuit. Let's assume we have 5 different states of competition: monopoly, duopoly, oligopoly, competitive (private), competitive (public). The latter are different, in that a private user can take advantage of Moore's law, while public service providers benefit as well from scale economies of the network effect (Metcalfe's laws). The concept of private vs public is easily understood and recognized in both the changes in the voice markets of the 1970s to 1990s (PBX's going to VPNs) and data markets of 1990s to 2000s (LANs/client server going to the internet/cloud). The increase in the addressable demand and/or range of applications results in significant scale economies driving enormous cost savings. Now let's put our model comparing the 5 states in motion. Assume the monopoly is quasi regulated and society as a whole is aware of decreasing technology costs. As a result let's say they are generous (or are forced to by the regulator) and drop pricing 6% per annum. Over 10 years our 100 mbs circuit costs $2,693, a reduction of 46%! Wow, looks good. Now let's say we have a duopoly, which the article states is the case with multi-model competition. In that case 10% price drops have been the norm and in fact we end up with pricing 65% below where we started, or $1,743! Wow, wow! Everything looks fantastic!! Just like the article says. But wait, there is a catch. That's really not how it happened, because bandwidth is not bandwidth is not bandwidth, as Gertrude Stein once said. Bandwidth is made up of the layer 1 (physical, say coax, fiber or wireless mediums) and layer 2 costs (transport protocols or electronic costs), but also can be impacted by layer 3 switching (tradeoff for both physical and transport layer costs depending on volumes and type of traffic and market segments). In many instances, there is monopoly in one geographic area or layer and it can create monopoly like price/cost constraints everywhere depending on the nature of the application and market segment in question. But I digress. Let's keep it simple. So let's just say we have an oligopoly (we really don't on a national basis even in wireless, which is a duopoly as far as the upper 50% of the market of users is concerned) then we could reasonably expect to see 15% declines. Then that same circuit would cost $984 today, 80% below prices 10 years ago, but more importantly, 63% more gross margin for a competitor or value added reseller or application developer to work with to put into innovation or leasing or building out additional capacity to serve more demand. Uh oh! Now the conclusions in the article don't look so rosy. But wait. It gets worse. Very large users still get to take advantage of Moore's law because they have buying power and, well, because they can; 95% of us can't. If you peek under the covers of our telecom infrastructure, private networks are alive and well and getting cheaper and cheaper and cheaper. (And in the process creating diseconomies for the rest of us left on public networks). In urban markets, where most of these large customers are, price declines (but only to these customers) have followed Moore's law on the order or 35% per year. So that $5,000 circuit is in fact approaching or at $67. A whopping 98.65% cost savings! Absolutely f—king insane! Most people don't realize or understand this, but it's the primary reason Google (a huge "private" user) can experiment with and "market" a 1 gig connection for $70/month to the end user (the other 95%) in Kansas City. Finally, let's not forget about Metcalfe, our 5th and final state of competition. (By the way he's the generally accepted originator of Ethernet, which is powering all our local area data networks (LANS) and increasingly our metro-area (MANS) and wide area networks (WANS), but most importantly all our WiFi connections in all our mobile devices). Metcalfe's law (or virtue as I call it) is that the cost of a network goes up linearly while the potential pathways, or traffic possibilities, or revenue opportunities goes up geometrically. In other words costs go up minimally while value grows exponentially the more people use it. The internet and all the applications and application ecosystems (Facebook, Google, Amazon, etc…) are one big example of Metcalfe's law. And the implication of Metcalfe's law is to scale Moore's law by a factor of 2. Trust me on this, it’s slightly more complicated math but it’s true. So let's be conservative and say the price drops per bit should be around 60% (10% less than 2 times 35%). That means that the $5,000 circuit 10 years ago should cost....$0.52 today. Huh???? 52 cents?!?! Say it ain’t so! That my friends is what could be. What it should be. And unfortunately, why the application world is look like it's 1999 all over again, and why our economic growth has declined and why countries, who don't have our information economy scale have raced ahead of us. It's not about density or regulatory edict/policy. It's simply about the lack of competition. Actually, the right type of competition which requires another article. Competition of the 1980s and 1990s brought about digitization and price declines of 99% in voice, data and wireless. But revenues grew anywhere from 6%-25% annually in all those segments because 3 forms of demand elasticity occurred: 1) normal demand/price elasticity; 2) shift from private back to public; and 3) application-driven elasticities. Basically there was a lot of known/perceived, latent/stored and potential demand that was unleashed simply by price declines. And that is precisely the point we are at today, that few if any appreciate, and contrary to the assumptions and conclusions of the article.